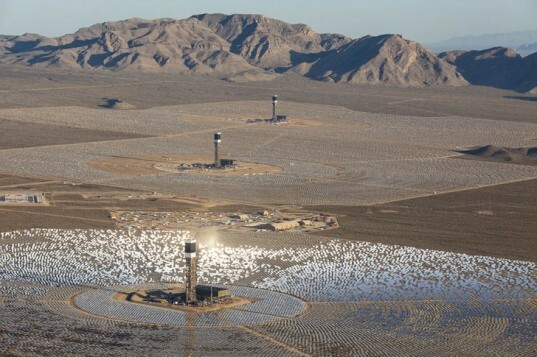 The world’s largest solar power plant, the Ivanpah Solar Electric Generating System, officially opened for business a few days ago, but not all environmentalists are happy about it. 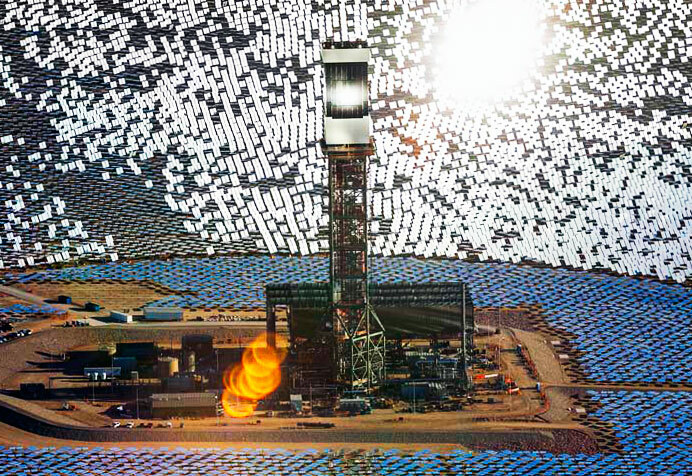 The plant consists of 350,000 mirrors spread across 5 square miles, and it works by concentrating sunlight to boil water in a series of enormous towers hooked up to steam generators. That incredible amount of heat does more than just generate power, however; it also fries any birds that happen to fly over the plant. This has actually been a known side effect of this type of solar plant from the start, and it’s a concern that may keep similar projects from being approved in the US. The air above the plant can reach temperatures up to 1,000 degrees Fahrenheit (537 Celsius), and the reflective surface of the mirrors resembles a lake, which biologists say could end up luring birds to their deaths. The way the plant scorches birds is horrifying, but the California Energy Commission believes the loss of wildlife — about eleven birds a month — is a price worth paying for 140,000 sustainably-powered homes. While any loss of life is upsetting, the fact of the matter is it’s a drop in the bucket compared to the number of birds killed by other forms of human infrastructure: an estimated minimum of 300 million birds a year are killed simply by colliding into buildings. Even domesticated cats kill far greater numbers of birds each year. And other forms of clean energy can be just as problematic as the tower solar plants, with wind turbines killing at least 10,000 birds a year (some of them bald eagles). No power generating system that harms wildlife is ideal, but this type of solar plant is still vastly less harmful to birds than the alternatives. After all, coal-fired plants harm more than a handful of birds each month — they release greenhouse gasses and toxic pollutants, warming the planet and making people and animals near the plants ill. Unlike a nuclear power plant, the catastrophic failure of a solar plant won’t leave the surrounding area tainted with radioactivity for decades or centuries to come. It’s likely the Ivanpah plant will remain controversial due to the bird death toll, but in the grand scheme of things, it’s far less damaging to the environment than the other energy sources we’re already using. Make mine crispy, hold the feathers. Seriously.... 11 birds a month? As the article states, other power generation systems are far worse. This is not a good thing - but then what is the alternative. I guess when you look at the alternative, this is not a terrible thing. Having said that, we know how bird navigate and work don\\\'t we? Can we not setup a disturbance field of some sort, I am no scientist, but something to that effect. I am sure they have tried that already. Makes me think of what my mom always says, "There is nothing for free in this world, not even the air you breathe. You need to live a responsible, action driven life to deserve every breath you get." Love my mother\\\'s wisdom. Namasté! There are more issues than indicated in this article. The desert is under major assault from the renewable energy sector. If there was only one desert solar project using this technology, it might not have a huge impact on birds, though any negative impact is not good. The fact is, there are several, and MANY more solar projects are in the works for our deserts. It is not just that birds happen by on occasion. The shiny heliostatic mirrors look like water, which in a place as arid as the desert is obviously very scarce. The mirrors can actually attract birds that are seeking water from a distance. When they get close they are either fried or may even collide with these objects. Additionally, this is prime habitat for the Federally Threatened desert tortoise. This project destroyed over 5 miles of pristine desert, which is habitat for not only desert tortoises but for many other desert plants and animals. Development is putting stress on the animal and plant life and they are running out of places to go! Many people may not be aware that the Creosote shrub rings that dominate in this landscape could be thousands of years old. Much older than our beloved redwoods. Google \'King Clone\', Lucerne Valley, CA. Desert plants grow very slowly--often less than 1 inch per year. Once destroyed that land will not return to its previous state for hundreds or thousands of years. I drove by this project just last week. It is so bright that I had to put my hand up to block the light from the towers so that I could see the road. Reports are coming from airline pilots who are also being blinded by the bright light. Solar should be on ROOFTOPS close to where the need lies or only previously disturbed land. PV doesn\'t have most of the problems that this project has, the notable one being destruction of pristine lands. We are smarter than this. This is not something to be celebrated. It is not green, not environmentally sound--it is just destroying what little is left of our wilderness. I reiterate the comment below: I also cannot understand why they didn't use photovoltaic panels instead of mirrors, which absorb heat rather than reflect it. And as for the towers, to which the mirrors are directed in order to heat water to boiling point, I would prefer my duck steamed then roasted, rather than the other way around. And as for wind farms, Golden Eagles were never meant to become Bald Eagles on route. Wave and tidal power installations on a massive scale, incorporated in coastal defences, which protect man-made sheltered lagoons and wetlands in order to encourage fisheries, bird sanctuaries and wildlife would be my preferred energy choice for the future. Think orchestration, and think diversity of investment potential. Then they need to determine a tolerable heat gradient for the birds and then develop some netting or barrier to deter them. This article makes the mistaken claim that wind turbines are killing bald eagles. I have seen no reports of this ever happening, and I used to work in the field of mitigating wildlife impacts of wind power. If this had ever been reported, up to a few years ago, I would have known about it. The citation was about offering wind power operators permits in case it should ever happen, not that it ever has. On the other hand, the wind farm at Altamont Pass in California has a very bad record of killing golden eagles, and is the subject of much research on how to avoid it. The problems at Altamont seem to be related to specific conditions in that area, and have generally not been seen at other wind energy facilities. While the loss of birds is lamentable, at the end of the day (and this is supposition on my part as I have no stats to refer anyone to) I suspect that more birds die from the environmental impacts of burning coal to generate electricity than from concentrated solar power. Photovoltaic panels don't kill anything. They're cheap and they work. I suppose that's why they weren't used. Lesser of evils is the argument? You make fair points though, but I can't help but feel such intense focused heat in the area is going to do more than kill birds in the long run. Meanwhile, perhaps biologists and designers can develop a means to deter or redirect bird flight away from or around the problem areas.